Fujitsu Limited,1QB Information Technologies Inc.
(Canada dateline: May 15, 2017) Fujitsu Limited and 1QB Information Technologies Inc. announced that starting today they will collaborate on applying quantum-inspired technology to the field of artificial intelligence (AI), focusing on the areas of combinatorial optimization and machine learning. The companies will work together in both the Japanese and global markets to develop applications which address industry problems using AI developed for use with quantum computers. This collaboration will enable software developed by 1QBit for quantum computers to run on a "digital annealer," jointly developed by Fujitsu Laboratories Ltd. and the University of Toronto. 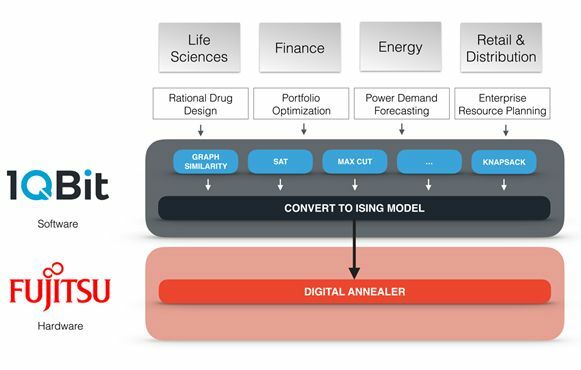 A digital annealer is a computing architecture that can rapidly solve combinatorial optimization problems using existing semiconductor technology. Over the last four years, 1QBit has developed new methods for machine learning, sampling, and optimization based on reformulating problems to meet the unique requirements of interfacing with quantum computers. The company's research and software development teams have focused on solving sampling, optimization, and machine learning problems to improve applications in industries including finance, energy, advanced materials, and the life sciences. The combination of Fujitsu's cutting-edge computer architecture and hardware technology, and 1QBit's software technology, will enable advances in machine learning to solve complicated, large-scale optimization problems. Fujitsu has systematized the technology and its experience with AI under the name of Zinrai, which has developed over the course of more than thirty years. The platform will support customers in using AI and will be available as the Fujitsu Cloud Service K5 Zinrai Platform Service. Fujitsu will offer the results of this collaboration as an option in the Fujitsu Cloud Service K5 Zinrai Platform Service Zinrai Deep Learning, a Zinrai cloud service, during 2017. In the future, the two companies will provide a variety of services that combine 1QBit's software and expertise in building applications which benefit from the capabilities of quantum computers, with Fujitsu's hardware technology, its customer base - the largest in Japan - and its versatile ICT capabilities, including AI. The partnership aims to contribute to the creation of new businesses and the transformation of existing businesses by introducing new solutions to the computational challenges facing customers in a variety of fields, including finance, life sciences, energy, retail and distribution. 1QBit is dedicated to building quantum and quantum-inspired software to solve the world’s most demanding computational challenges. The company’s hardware-agnostic platforms and services enable the development of applications which scale alongside advances in both classical and quantum computers. 1QBit partners with Fortune 500 clients and leading hardware providers to redefine intractable industry problems in the areas of optimization, simulation, and machine learning. Headquartered in Vancouver, Canada, 1QBit’s interdisciplinary team of 50 comprises mathematicians, physicists, chemists, software developers, and quantum computing experts who develop novel solutions to problems, from research through to commercial application development.